While both raw and roasted almonds contain a good deal of heart-healthy fat, fiber and protein, the roasting process does make a limited contribution to the number of calories and grams of fat in this food. Roasting also slightly reduces the almonds' vitamin content. Whether you select raw or roasted, however, you can be sure to receive a healthy dose of nutrients. Raw and roasted almonds contain a comparable number of calories, with raw containing 161 calories per ounce and roasted containing only 9 additional calories per ounce. Dry roasted almonds contain the same number of calories per ounce as raw. In general, nuts are a high-calorie food; thus, the portion size should be limited to avoid consumption of excess calories. In the case of nuts, one ounce is considered one serving. Although almonds do contain a fair number of calories in a small serving size, they are nutritionally sound, given their content of unsaturated fat, fiber and protein. Both raw and roasted almonds contain a large quantity of unsaturated fat, with raw at around 12 grams and roasted at around 14 grams per ounce. Of note, dry roasted almonds, which are cooked without oil, contain the same amount of fat as raw almonds. In the roasting process, however, almonds may lose up to 15 percent of their own healthy oils, according to Dr. Mehmet Oz, and chemicals that promote aging may be formed at high temperatures. Thus, in terms of retaining all of the naturally-found beneficial fat, raw almonds are more desirable. Both types of almonds contribute a significant amount of fiber, at around 3 grams per ounce -- 12 percent of the recommended daily intake for women. Fiber is an important component of this food in terms of its ability to keep us satisfied and avoid overeating. If you choose almonds as a snack, for example, you can expect that they will keep you feeling full for a longer period than would a food without fiber, such as that cookie that might tempt you in the snack aisle. Both raw and roasted almonds contain around 6 grams of protein per ounce. Like fiber, protein helps you feel full between meals. It delays gastric emptying, keeping us satisfied for a longer period and preventing cravings. Consuming protein also provides your body with amino acids it needs to maintain healthy tissues. A diet rich in protein offers other benefits, including improved oxygen transport and a robust immune system, which helps keep you free of disease. Along with heart-healthy fat, protein and fiber, nuts also contain a healthy dose of vitamins and minerals. In terms of vitamins, almonds are rich in vitamin E and riboflavin. As an antioxidant, vitamin E provides protection for cells against oxidative stress, making it a part of a healthy diet for disease prevention. 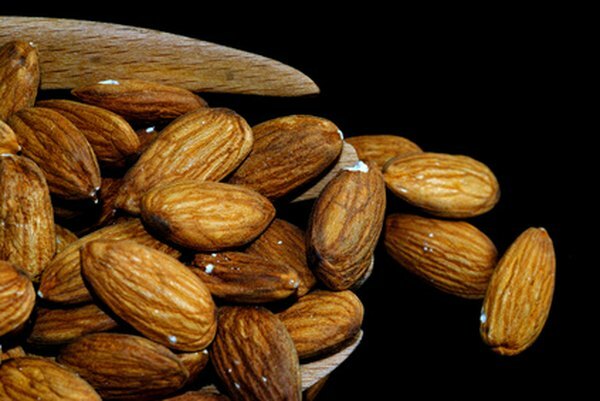 Roasting destroys some of the almonds' vitamin E -- raw almonds contain half your vitamin E intake for the day, while oil-roasted almonds provide 44 percent. Almonds are also rich in minerals, namely magnesium, copper, manganese and also a smaller amount of calcium. Magnesium is involved in nerve and immune function, maintaining the heart's rhythm, as well as bone health. Roasted and unroasted nuts contain equivalent amounts of minerals. ShareCare: Are Roasted Nuts Just as Healthy as Raw Nuts?